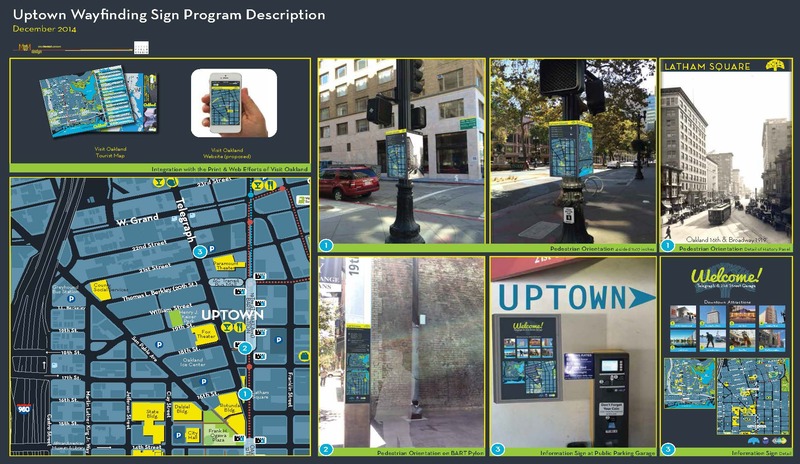 The City of Oakland, through a grant provided by the State of California Infill and Infrastructure Program, initiated the Uptown Wayfinding Signage Pilot project in the spring of 2014. The pilot project brought together key City staff and interested stakeholders including Visit Oakland, the Lake Merritt/Uptown Business Improvement District (BID). the Downtown BID, and the Jack London BID. The project is based on the observation that existing signage in the Uptown area needs improvement and that well designed signs add value , legibility and have a positive impact on the City. The planning area was limited to a concentrated triangle bounded by 14th Street. to the south, West Grand to the north, San Pablo Avenue to the west and Broadway to the east. Early in the process, it was acknowledged that the best wayfinding systems feature consistent standards that can be adapted and altered as required to locate existing destinations. The standards can also be modified to feature future development. Creating a consistent and recognizable graphic and placement standard typically results in a system that responds to the goals and planning vision of the City, and ensures that the system is comprehensive and appears neither fragmented nor piecemeal. Disorganized and uncoordinated signs serve to detract from their environment, leading to sign clutter and potential confusion for visitors and residents. 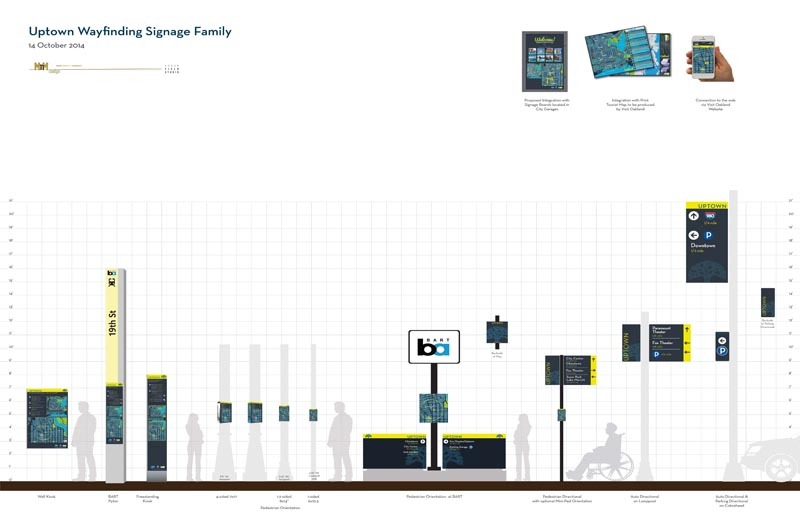 One of the key recommendations of a 2013 study commissioned by Visit Oakland was to substantially improve on and create a wayfinding system. 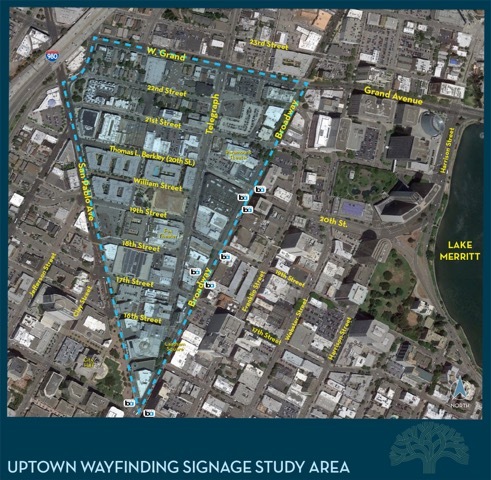 The Uptown Wayfinding Signage Pilot Project is a vital tool of economic development. Incorporating a signage and wayfinding system as part of the planning process is critical to the effectiveness of the City's revitalization strategy for the Uptown District and the City as a whole. Click here to see a PDF version of the image above which provides a Program Description. The new Wayfinding system for Oakland is designed to project a consistent image for the Uptown District and to serve as a Design Guideline for the entire City. Connect public spaces showcasing Oakland's diverse neighborhoods and unique character. Develop Vehicular and Pedestrian Wayfinding System for Destinations in the Uptown Area. Promote walking, bicycling & use of transit. Promote the history of Oakland and its Landmark Architecture. Project a consistent image for the Downtown. Define a Sense of Place and Enhance Oakland's Commercial Brand. Leverage Resources and Link Sub-Districts in phases over time. Work with Stakeholder groups in the planning, design and implementation process. Click here to see an image of the project goals and objectives. Wayfinding is the experience of an individual making their way through an unfamiliar environment. Effective Wayfinding systems direct people to their destinations. This creates a "legible city" where wayfinding elements support the overall urban structure and experience. The use of consistent terminology and graphics across a range of mediums builds trust in a Wayfinding Program and gives the user confidence that the information presented is accurate, up-to-date and part of an overall system. Click here for an image of What is Wayfinding? This PowerPoint presentation summarizes the methodology and reflects the process that was undertaken to date. The Uptown Wayfinding Signage Family summarized in this document, seeks feedback on each sign, sufficient to build a technical manual that improves wayfinding for visitors and citizens alike. Once chosen, the "Sign Family" will be forwarded to the Design Sub-Committee of the Planning Commission for review and comment. Implementation is planned in multiple phases spread out over the coming years and is sensitive to the budget constraints and the grant limitations for the "Uptown Wayfinding Pilot Project." Click here to take the Wayfinding Signage Survey. Please complete, as your input is vital to shaping of the final product. Please contact George Durney, Uptown Wayfinding Project Manager, at (510) 238-6150 or gcdurney@oaklandnet.com.